The rain is tapping on the roof and gutters. Ben is hiding in his room playing on his computer. I have shut the door on my bedroom to keep the noise down. Targa is hiding on the sun porch. Tucker… Well Tucker is an idiot. I’m not sure where he is, probably in the middle of the insanity. What is the ruckus down the hall? It must be Will’s sleepover party. 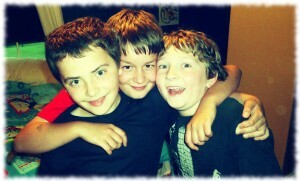 He has two of his friends over (Tyler and Shane). The remnants of Tropical Storm Andrea help keep the chaos inside for the evening. But not to worry, the fun started outside in the pouring rain in the afternoon. Will and friends were soaked. Ben wisely stayed inside with me. Again, Targa stayed on the sun porch and Tucker, well let’s just say Tucker was as wet as any of the boys. By now dinner has had a chance to settle. Everyone (except the sleepover group) has calmed down. Even Tucker is sleeping on the bed. Hanging with the fourth graders is just too much for a little beagle. The house is suddenly surprisingly calm. Which means that they probably went outside (or getting into trouble). Time to go check on them.